1. Gently heat a frying pan over a moderate heat, add the oil, onions and chilli and cook for about 15 mins. Spoon on to a plate and wipe the pan. 2. Divide the ingredients between the 4 wraps. Sprinkle a generous amount of cheese onto one half of each wrap and top with ham, turkey, onion and more cheese. Add a little coriander and fold the wrap over to make a half-moon shape. 3. Heat a large frying pan again and brush lightly with a little oil. Place 2 wraps into the pan and cook gently over a medium heat for 1-2 mins on each side, until they’re golden and crisp. Repeat the process and serve with sweetcorn chutney on the side. 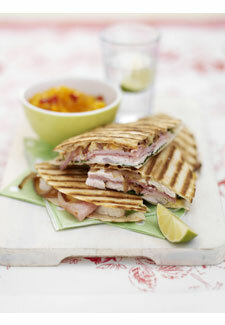 Turkey is a great low fat alternative to chicken – for more mouthwatering ideas, go to turkey recipes.